Everyone dreams of owning it all, but no matter how hard we try, we just can't do it. You can't own everything... unless you're playing Capital ST. Grab your checkbook, stuff your accountant into your briefcase and hit the road to success. In Capital ST, you move around the country, buying up as many properties as you can while steering clear of good ol’ Mister IRS. Make sure you don't land on your competitors’ property, or you'll have to spend some bucks. After you de-ARC the file CAPITAL.ARC, found on your disk (instructions are on the disk), you will have four files: CAPITAL.PRG (the program; run it from the desktop), CAP.RSC (the resource file), USAMAPHI.P13 (monochrome map of USA) and USAMAPLO.P11 (color map of the USA). All of these files must be kept in the same directory for Capital ST to run properly. To run the game, just double-click on the CAPITAL.PRG icon on the desktop window. The program will load and run automatically. Capital ST runs only in low or high resolution. When the program first runs, you are presented with the intro screen; click on START to proceed. 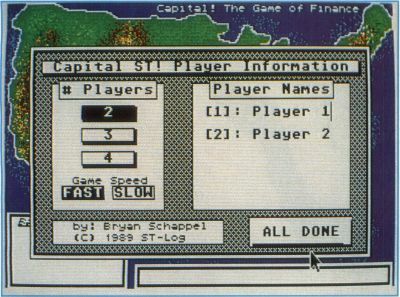 The CAPITAL PLAYER INFORMATION dialog then pops up, allowing you to select your play options. Clicking on one of the numbered buttons changes the number of players in the game; this may be set to between two and four players. Clicking on FAST or SLOW selects the game speed. As you will notice, there is a section of the dialog labeled PLAYER NAMES. This section contains an editable field for the name of each player. The names default to "Player N," where N is the player number. By typing in your actual names, the game becomes more personal. Click on ALL DONE to begin the game. Each player starts the game with 375G. (The "G" stands for "Grand." In Capital ST, all money is handled in denominations of $1,000.) In the lower-right corner of the screen you will notice tokens. There is one token for each player in the game; Player l's token is a "1," Player 2's token is a "2," etc. These tokens will move around the path and indicate which property you are on. Directly beneath the tokens you will notice a long white bar. This is where the name of the property that the token's on gets printed. You will also see some notices appear on this line; when a message appears on the line, the program pauses a little longer to let you read it. In the lower-left corner of the screen you will notice a large white box labeled "Bank Accounts." This table shows how much cash the players have on hand. You can keep an eye on this to see who is going broke. In the middle of the screen you will notice two large dice rolling. You may press the left mouse button to stop the dice from rolling and make a move. If you press the right mouse button, a dialog appears that will allow you to end the current game and either start over or exit to the desktop. As mentioned earlier, Capital ST has two modes of play: Fast and Slow. When playing a fast game, if a player does not have enough money to pay taxes or pay another player's fee, that person is declared broke and sent to debtors' prison. In a slow game, the bankrupt player is forced to sell off enough of his properties to pay his debts. This screen contains a map of the United States. There is a path encircling the U.S. that is mostly made up of properties you may buy. There are two types of properties—Single and Double. A Single property takes up one map square and you can buy the whole thing at once. Double properties are a little different. They are paired and take up two adjacent map squares. When you land on an unowned Double, you have the option to buy it (just like any other property). If you do buy the first half, you have the option of buying the second half, then and there, for twice the price. Owning both halves of a Double has advantages: When another player lands on either half of the double, he pays the sum of the fees. You can tell which properties are Singles and which are Doubles by looking at the screen. Single properties are formed of thin concentric squares, and Double properties are formed of thick concentric squares. When a property gets bought, either an "X" is drawn through the property icon (in low resolution) or the word "Sold" is printed on the property icon (in high resolution). You will also notice other squares scattered on the path, which are not normal properties. Here is what those squares are and what they do. The "L" square is "The Luck Square." There are two of these on the path. Each one can bring you good or bad luck. If you have good luck, you could win ten grand, 15 grand or a free improvement for one of your properties. If your luck is bad, you could lose ten grand, half of the value on a property or half of a property fee. These squares are always random, so you can't predict what will happen. The "$" is "The Stock Market." Every time you land on or pass this square, you get 12G in stock dividends. Not too bad. The "H" is "Vacation Time At the Hogg Hilton." There are two of these squares on the path. Landing on either of these squares has no effect on your cash reserve. You do, however, have to take a holiday and may transact no business on this turn. If you land on an unowned property, on Capital Gains Tax, or you are put in debt (in a slow game only), you are transferred to the Capital ST Transaction screen. It is through this screen that almost all business transactions take place. From this dialog you may buy, sell or improve a property. When you first enter the transaction screen, all the information about the property you landed on is displayed in the top half of the dialog. This information contains the property's name, owner, fee, full and market value, number of improvements and Double status (yes or no). At the bottom of the dialog is a box labeled "Your Options." This box contains four buttons. If an option is not available, it will be shown as deselected (the text will be grayed out). The first time you enter the transaction screen, the only options you will have are BUY and EXIT. If you press BUY, you become the proud owner of the property you landed on. Pressing EXIT will take you back to the map screen, allowing the next player to move. If you elected to buy the property, the SELL and IMPROVE buttons become active and you may perform these actions if you wish. If the property you landed on was a Double, the BUY button is renamed the DOUBLE button, and it allows you to purchase the other half of the property for twice the price. If you elect to sell or improve any of your properties, the buttons at the bottom of the screen are renamed to NEXT, BACK, SELECT and EXIT. The NEXT and BACK buttons allow you to browse through your property list; pressing SELECT, naturally, selects the property that is displayed; and pressing EXIT will abort the property-selection routine. You are allowed to improve a property three times; each time an improvement is made, the value of the property is increased by five grand and the fee is doubled. Improving a property costs you ten grand. When you select the property to improve, make sure the improvement level is below three before you press the SELECT button. If you do not check this, it does not cost you any money, but you may not select another property to improve until your next turn. When you opt to sell one of your properties, you do not get the full value of the property at the time of sale. You will receive a fair market price, which is determined when you enter the transaction screen. The market value will range between half and full value. The only exception to this rule is during forced sales in a slow game. When you are forced to sell off your properties, you will only get half value for them—no exceptions! This is the penalty for improperly handling your cash supply. During a forced sale, the EXIT button becomes deselected. You will notice that directly above the option box there is a small white box included to remind you of what you are doing. It is easy to be selecting a property and forget whether you are improving or selling. Well, that's all you need to know about how to play Capital ST. Let's talk about the fun stuff. Capital ST was developed on a MEGA ST2 with the Laser C development system. It is my first program ever written in C. The player tokens were accomplished with the Line A sprite routines, and the dice and property squares are raster sprites displayed with the vro_cpyfm function. Great thanks to Clayton Walnum for all the support that made this game possible. Getting the map screens into the ST was the hard part. 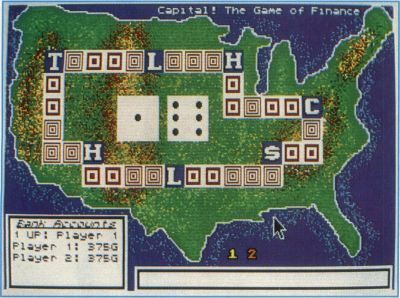 The 8-bit version of Capital was programmed in ANTIC mode 4 (a character mode). This screen was then converted into a graphics 7.5 image that was dumped to my Panasonic printer. The map was then cut out of the paper and the resulting outline was taped to my ST monitor. The map was drawn freehand using DEGAS Elite. (That is why it is not 100% accurate. Don't teach geography class with it, okay?) The mountains were produced with the DEGAS block functions and then touched up considerably with the airbrush. All the raster sprites were created with Seurat because of its incredible ZOOM mode. The zoom function plots a grid on the screen, allowing precision work within a predefined area. The sprites were then cut from the screen using the Raster Sprite Editor from ST-LOG #16. I had a horrible time with "mouse button bleed through" between the AES and the VDI. Refer to my source code for the solution to this dilemma (see the ROLL-DICE routine). The idea came from Charles F. Johnson's Mouse-ka-mania article, which can be found in ST-LOG #18. All in all, this was an incredibly fun project and I will gladly write more programs for the ST (what a joy it is!). Until then, enjoy strutting your financial acumen! 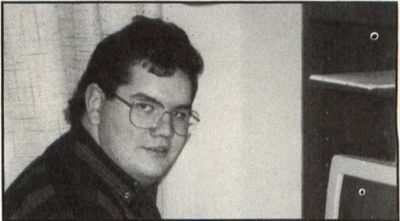 Bryan Schappel lives with his wife in Madison, Wisconsin. In their free time they play Dungeon Master and watch Monty Python reruns and Warner Bros. cartoons.